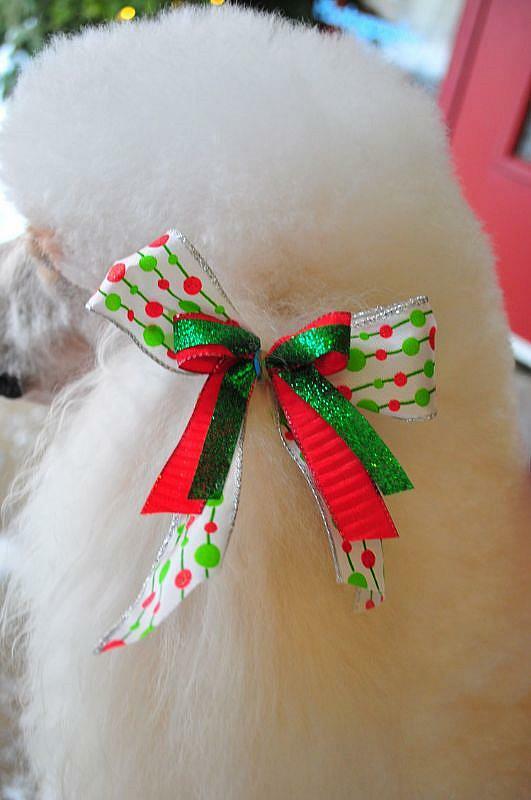 Yesterday, my beautiful cream Standard Poodle Paris had her Christmas groom. (Background: As an ex show dog, Paris became accustomed to regular long grooming sessions at an early age. To this day she just loves being bathed and groomed and from what she gleaned from her show days, she knows she looks special. She came to expect to be on exhibit, and wants to put on a show). It was not a stretch of the imagination for me to automatically want to photograph Paris after each of our grooming sessions, for she looks so darn cute and I love to take pictures. 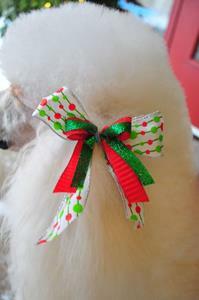 Fast forward to yesterday, in the minutes right after her fresh new Christmas haircut & beautiful sparkly bows. Paris and I drove around town looking for a suitable place to capture her newely groomed beauty, Paris gazing out the car side and back windows, while Mom (played by me) drives all over town looking for that perfect setting, all the while wondering what I will do when I find it seeing as I had pretty much settled on finding a privately owned house, knocking on their door, and requesting permission to photograph my Poodle on their doorstep. That is exactly what I did when I found this house. My intention was not to shoot & run. I looked and there were two cars in the driveway which lead to me stopping there at all. There was a newspaper in a lime green paper bag on the doorstep, which never would have worked for the photograph So I picked it up, ready to present to the home owners when they answered the door. The homeowners did not answer the door, however. At that point I was quite befuddled because of the two cars in the drive, but then just figured maybe they don't answer their door to strangers. As I went to leave, Paris, however, continued to pose in front of their door waiting for me to turn around and point the camera in her direction. Waiting to hear the click of the camera and all the praises that went with her normal after groom process. I couldn't disappoint, so I obliged her. However, I was about one step too close when I hurriedly shot the picture while trying to make a fast exit once I realized I may not be welcome, and this is the result. This quick turn around and shoot and go picture would have been so much nicer if I had taken one more step first, and not missed her toes. On the way home Paris tried to tell me she wished she could live in such a grand home, but all I had to do was turn on our heated mattress pad and as she lay across my pillows she was in Poodle Heaven and forgot all about that cold brick verandah nonsense..
As of this writing I am halfway convinced I should make another visit to the home, perhaps on a weekend, and introduce myself as the one who left dog prints along their walkway and ask for permission to re-shoot the picture. The other half of me wants to just be happy with this image and it's story. As far as Paris's grooming goes, I do about 85-90% of it as of this writing. I practice sculpting Paris's hair in between her major "overhauls" under the tutelage of Felicia Nikkunen, Paris's official groomer. Epilogue: I decided to come clean to the homeowners. I had a Christmas card with this picture printed at my local camera store, and mailed it to them, along with a printed copy of my show entry. I also included a note which explained I really didn't mean to intrude and if they were offended I was sorry. I imagine they have a Christmas story to tell.